There is an overwhelming abundance of flashlights on the market, and choosing which product is the right one for you can be challenging. Today’s flashlights range from either cheap and poorly designed to well-engineered pieces of high tech gear, with price ranges from a few dollars for a basic light to well over a hundred dollars for the best rechargeable flashlights. No one wants to spend a bunch of money on a product that ends up being less than desirable when the time comes to put it to use. Rechargeable flashlights have been available for many years but the technology in lighting, batteries, and charging systems have become quite advanced and are continuously improving. Making sure you get the right product means you will need a good understanding of what you want in a flashlight, and solid knowledge of the technologies and features available. The purpose of having a rechargeable light includes both convenience and long term cost savings. High quality batteries are expensive, and they are subject to a limited usability lifespan, even when the flashlight is rarely powered on. A good rechargeable light reduces the need for constantly purchasing and stocking fresh batteries. A working knowledge of the different uses and design features of the best products available will help you get a good value for your money. As a user of a rechargeable flashlight, it’s important to know that the primary feature that makes a flashlight “rechargeable,” is really just the battery that powers it. We’ll cover a lot of information in the following sections; use it as a guide to what is important and what is available. This information was gathered from multiple sources, including sellers, manufacturers and users, so it is representative of what you will find on the market. As we mentioned, the battery determines rechargeability rather than features inherent to the flashlight itself. A standard flashlight becomes rechargeable just by using nickel cadmium (NiCad) batteries rather than alkaline batteries. NiCad batteries are an older but economical technology, generally available in the same sizes and voltage ranges as alkaline batteries. Chargers are available for specific sizes or for multiple sizes. Another battery type is the nickel metal-hydride (NiMH) battery, one similar to the NiCd in sizes and voltage ranges. The NiMH is a higher performing battery than the NiCad and more expensive. Along with the NiCad, NiMH batteries are the simplest way to add rechargeability to any standard flashlight. Individual cells are nominally 1.2 volts compared with 1.5 volt disposable batteries, so overall power will be lower, as will useable life between charges. Lithium Ion and Lithium Polymer batteries are the highest performing, most expensive batteries used in flashlights. Individual cell sizes and shapes vary, with a nominal voltage of 3.7 volts per cell, roughly equivalent to 3 nickel or alkaline based cells. The best modern flashlights use an LED (light emitting diode) as a light source rather than a filament bulb. LED’s are more efficient than filament bulbs and provide more light with less power and longer life. The best designs use a constant voltage circuit that operates the LED at a specific voltage, automatically shutting off power when voltage is low rather than letting brightness grow gradually dimmer, which makes a low voltage indicator useful. Modern designs have a multi-mode feature, which is relatively new to flashlight technology. Lighting modes allow the user to select the brightness level, which is important because full power is often not needed, and unnecessarily drains the battery. Lower power modes make more economical use of battery life and are useful when minimal or discrete lighting is preferred. Some flashlights have separate modes for signaling or strobe use, including an automatic, repeating Morse code S.O.S. signal. Both the S.O.S. mode and the strobe mode are important features for emergency use, and some strobe modes are incredibly bright and disorienting, which is useful for self-defense. In addition to variable lighting power settings, an adjustable zoom, or focus feature is a consideration for multi-purpose use and tactical use. Adjustable zoom allows the user to focus the beam from a wide flood setting to a narrow spot setting, for use at different distances from the lighting area. A high quality flashlight is made of high quality materials. Extruded, hardened, aircraft aluminum is the standard for flashlight cases, while lens caps and end caps should be machined from aircraft aluminum rather than die cast. The best aluminum finishes are anodized rather than painted, with a preference for dark gray or black for tactical use, with raised, anti-slip texture for optimal grip. Belt clips and internal, spring loaded battery contacts should be stainless steel. The on/off/mode switch should be stainless steel with a rubberized cover for weather resistance. Lens caps and end caps should be sealed with rubber O-rings, and a rubberized grip and anti-roll ring are important tactical features. Weight, while deserving of some consideration, is not as much of a factor as overall length and diameter. Overall size is determined by battery sizes, which are indicators of power and brightness. 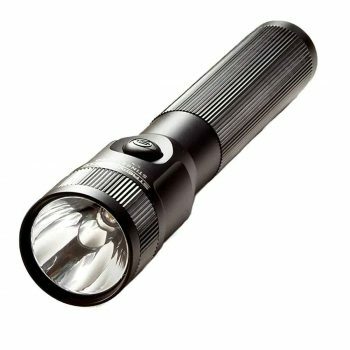 In general, ultra-compact lights should comfortably fit in clothing pockets, flashlights for tactical or firearm mounted use should be roughly an inch in diameter and 4 to 6 inches long, while utility lights can be longer than 6 inches. A review was conducted of flashlights from different manufacturers including a total of 6 different models, one of which is available in different lighting options and kit options. Reviews consisted of physical characteristics, practical features, and a description including usage, pros, and cons. Accessories offered by each manufacturer for each model, if available, are also identified. 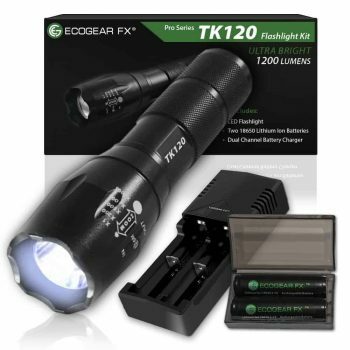 The EcoGear FX 120 Tactical Flashlight Kit combines the durability of aircraft grade aluminum construction with excellent LED lighting capability, variable brightness, and zoomable focus, to provide a compact tactical light at a reasonable price. The variable brightness mode feature extends battery life, while providing maximum lighting power when it is needed. The strobe and S.O.S. modes make it an excellent flashlight for communicating distress or location in emergency situations. The battery case provided with the kit is handy for storage and limits the tendency to lose or misplace the rechargeable batteries. The AAA battery adapter is a convenient as a spare battery option. Replacement batteries and LED chips are readily available. The light has been known to experience problems and defects, particularly with battery life, charging capability, and light mode switch functions. However, these defects are well known to the manufacturer and documented. User reviews do indicate that customer service and tech support are responsive, readily providing replacement products when defects are reported. Encased in sealed, black anodized, aircraft aluminum for durability, shock and water resistance. 5 setting zoom feature from x1 to x2000. 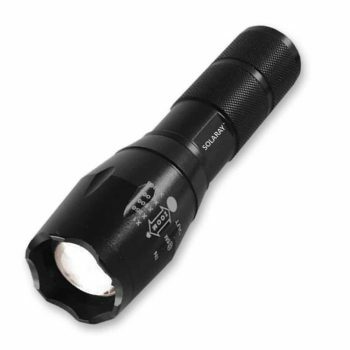 The Solaray Pro ZX-1 Flashlight is a durable, reliable, multi-use flashlight. The variable brightness modes and variable zoom settings add versatility. The bright strobe mode can be used to distract an attacker or intruder, and along with the S.O.S. mode make the light effective for emergency signaling. A padded battery case is included for safe, convenient storage of the rechargeable Lithium Ion batteries. An adapter for use with standard AAA batteries adds an additional option for power when recharging is not feasible. User reviews indicate some possible defects with battery charger and reliability of the on/off/mode switch. However, user reviews also report that the manufacturer is quick to replace defective products even after the limited warranty has expired. Related: Because eventually batteries lose their power customers who buy the Solaray flashlight also buy the Solaray Rechargeable Lithium-ion Batteries. The rechargeable batteries have PCB protection. They can be charged more than 500 times. They have a built in overcharge safety protection. Users should be ware that these batteries are not for use in vaping devices. The Streamlight 75712 Stinger Flashlight is designed for full size performance in a medium compact size. At the full brightness setting, this light produces 350 Lumen and 24000 Candela for superior beam intensity at a distance. The medium setting provides good lighting performance and extended battery life, and the lowest setting provides low glare with maximum battery life. The strobe function is useful as a disorienting feature against intruders or attackers, as well as attention grabbing emergency signal capability. All lights include individualized serial numbers for positive identification, which is a nice feature as the Stinger is one of the most expensive lights reviewed. Rechargeable power options include both the NiMH battery sold with the light or NiCad batteries, and standard alkaline batteries can be used as a non rechargeable option. Numerous options are available in expanded kits or sold as separate accessories. This kit adds both the DS (dual switch) feature with a 2nd switch located in the case end cap, and a 120 VAC charger adapter cord. Related: It is always important to take good care of any gadget one has. In order to properly take good care of this Streamlight Flashlight, customers who buy it also frequently buy the Nylon Holster. This unique holster is open ended for the purposes of better holding and easy access. 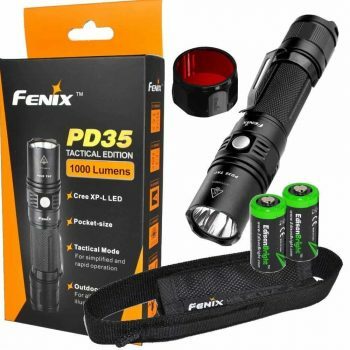 The Fenix PD35 TAC Flashlight is Fenix’s tactical edition of their base PD35 model. The case is durable, textured for non slip grip, and features flattened surfaces for anti roll. This light is well sealed, making the light suitable for waterproof use at a depth of up to 6.5 feet for up to 30 minutes. Dual mode operation provides a low and maximum brightness option for tactical use, and economy through maximum brightness options for outdoor use, with a strobe option in either mode. Mode memory turns the light on in the last mode used, which is handy for avoiding undesired accidental brightness or strobe effect in tactical situations. An included lens cap with red filter preserves night vision. On the downside, the included batteries are not rechargeable and standard alkaline batteries are not recommended, which is an inconvenience. The light is also more expensive than some of its rechargeable competition. 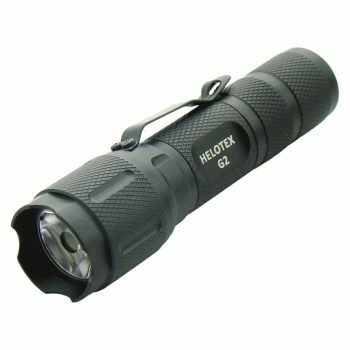 The Helotex G2 Tactical Flashlight is an ultra light, ultra compact flashlight that operates on either a single AA or CR123A battery. It is surprisingly bright for its size, at 120 Lumens with a AA battery and 130 Lumens with a CR123A battery. This flashlight can be used as a spare firearm mounted tactical light when combined with .06 inch thick spacer rings for use in standard 1 inch diameter mounting rings, but note that overall length is just over .5 inches less with a AA battery. Due to its small size, it doesn’t take up much pocket space so there is no need for a carrying case, and it easily clips to either a pocket or a belt. The flashlight is super simple to operate, with a full click pushbutton on switch that easily switches from full brightness to low brightness with a light tap. The light is also among the most economically priced available. This flashlight does not include a battery nor a battery charger, so the only option for a rechargeable feature is to use a separately purchased rechargeable battery and charger. Rechargeable CR123A and AA batteries are easy to find, though most combinations are nearly the same price as the flashlight. Related: It is often very difficult to tell when you go out to the darkness as anything might happen and you might just lose your flashlight. That is why customers who buy this flashlight often frequently buy it together with the Helotex G4 Tactical Flashlight. The body is strong enough as it is made of anodized aluminum material. 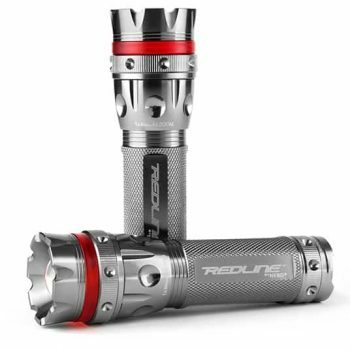 The final product reviewed, the Nebo 5581 Redline Tactical Flashlight is a highly durable, moderately powerful, multi-purpose flashlight with features that are comparable to some of the larger, more expensive tactical flashlights. A recessed, glow in dark push button switch makes it easy to use, and easy to find in the dark. It features 3 brightness modes that vary from 100% maximum to 50% medium, to a very discreet 10% brightness. For emergency and signaling use it can be switched to either a repeating Morse Code S.O.S. mode or a strobe mode. It is small enough to comfortably fit in a pocket, and large enough to accommodate 3 AAA batteries for extended battery life. It is sold without batteries or charger, so if rechargeability is desired you will need to purchase separate NiCad or NiMH rechargeable batteries and a charger. A glowing red plastic bezel ring makings it easy to distinguish from other lights in use, but that which reportedly breaks easily and is not replaceable. We reviewed three basic groups of flashlight, starting with those that either included, or offered separately, necessary accessories that include both batteries and chargers. In the middle we had options that included either rechargeable or disposable batteries but not chargers. At the lower scale, only the flashlight is included, in some cases without battery or charger availability from the flashlight manufacturer. A great deal of information was provided, but it’s only a fraction of the information available. Even smaller is the fraction of available flashlights our review included. There are literally hundreds of different products to choose from, so our review doesn’t include every possible feature in a flashlight. What kind of flashlight do you like to take with you? Do you have a favorite that isn’t on our list?